During our Caramoan Trip, we spent our last adventure at Matukad Island famous for its fine powdery sand that looks like a powder soaked in water. 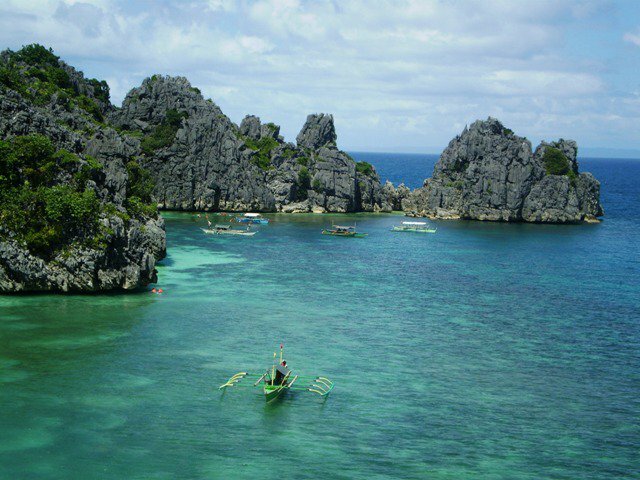 Matukad is also known for the mystic bangus (milk fish) that resides inside the secluded lagoon which is accessible by a steep ascend on its jagged rock formations. The eerie story of the milkfish is an added persuasion to climb the top even to faint-hearted persons. According to folks, long time ago there used to be two fishes in the lagoon until a fisherman caught one of those to fed his family which unfortunately has caused the death of everyone. Since then, no one dared to catch the remaining fish. The top lagoon offers a great scene of the island with an inviting dive-look of crystal clear water below. Also, climbing the triangular rock at the bottom of the lagoon will give you a closer look at the bangus and a unique picturesque of "I conquered Matukad lagoon". Matukad is truly one of the untouched paradises in our country. As we explore the area to check its camp capacity, we found a stinky place behind the rock formations. It was evidently the area where tourist unloaded their “call of nature” thing with white papers dispersed everywhere. As people rely on rain or nature to eradicate the marks it left behind, people should also be conscious of when the downpour will be. April just started then and rain would mean almost two months away. Haizt! we should all take part in making this world a paradise not just for ourselves but for everyone... Ahh!!! Anyways, Matukad is a “must” savored place in the Caramoan peninsula. I wish that its beauty remains unchanged for the next generation to enjoy. Ciao! hi.. the bangus is actually visible from above... i just don't have a good cam to capture it.